This soup is a copycat of the very popular one from OG (you know where I mean). I don’t know what their recipe is. But a few chefs out there have placed their own versions on the blogosphere and mine may be just like those. All I know is that I’ve done it so many times, I don’t go by a recipe but I know the ratios well enough. I’m not writing a cookbook, so you’ll have to trust me. 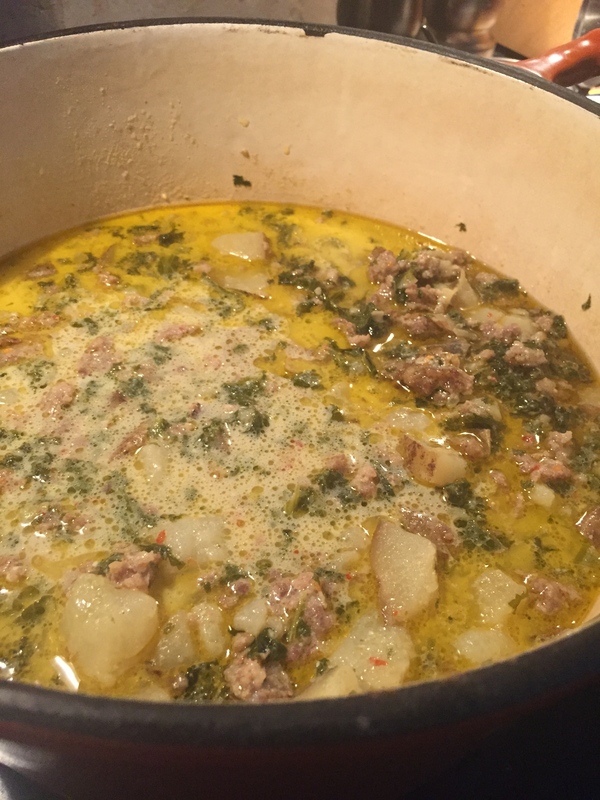 This recipe gives you a bit of leeway depending on the amount of sausage you want in it and how you like your potatoes. mr. foodie likes his meaty. So I double the sausage from 1 to 2 pounds. And he likes varied texture so I usually slice up link sausages and ground sausage and brown them together. It’s vital that you use HOT Italian sausage. I guess you can use sweet/mild and add heat but this way— It’s just so yummy and spicy. It will make you feel ALIVE. 4-5 Medium sized russet potatoes, roughly cut into bite size pieces or sliced thin. Whatever. 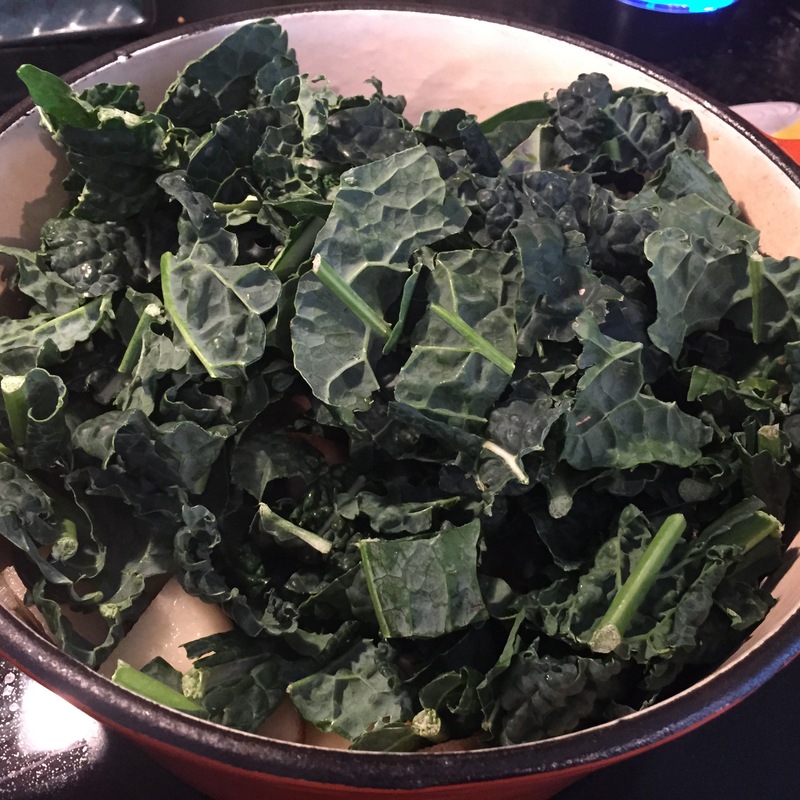 4 cups chopped kale (again bite size pieces or bigger if you like it rustic). The pics show a Tuscan kale, but I usually use the curly kale too that’s more common. 1/2-1 cup heavy cream. Depending on how creamy you want it. You may replace with milk or half & half. It just won’t be as creamy. Here’s what I do. I use a half cup of cream, then I add milk until it just hits the top of the ingredients in the pot. In a dutch oven or large pot, brown the sausage. If you use links, you’ll want to take them out, let them cool a bit then slice at 1/2 inch thickness. They may crumble out of their casings a bit. That’s okay. You may decide to drain a bit of the grease. It varies for me. 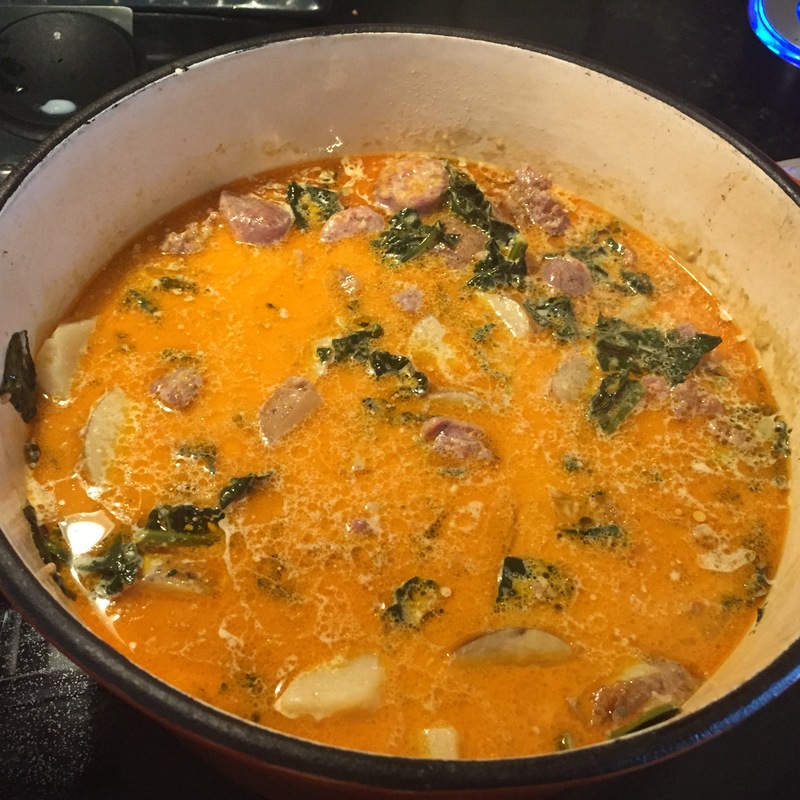 I kind of like the color that reddish bit of rendered fat gives the soup. It’s up to you. While the sausage browns, chop your potatoes. Chop or slice as thin as you like. We like it rustic and we cook it a bit longer so they get very tender but you get larger, more tender bites. You know what you like. 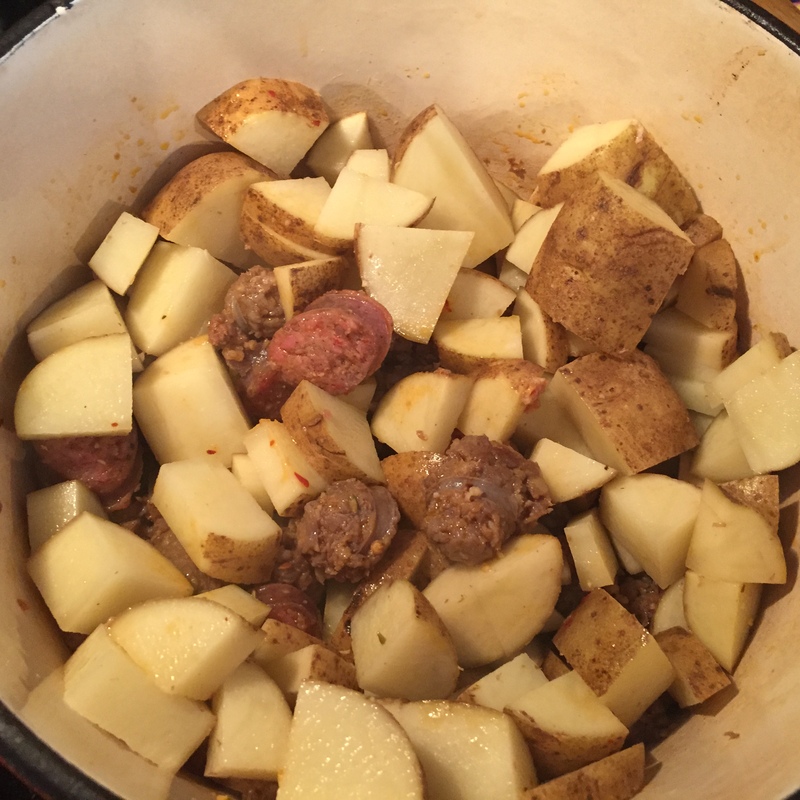 Add potatoes to the sausage in the pot. Add onion, garlic, and seasonings, then kale. Add stock or broth and bring to a boil. Slowly stir in cream or milk. You’ll want the liquids to just graze the the top of where the veggies come to. The kale will wilt down a lot. Just simmer on medium low until the potatoes are tender. You can go back and mash them up with the back of your spoon or you can leave larger…again, up to you. I let mine go for a couple of hours but it will probably be ready in one hour. Taste and adjust seasonings as needed. 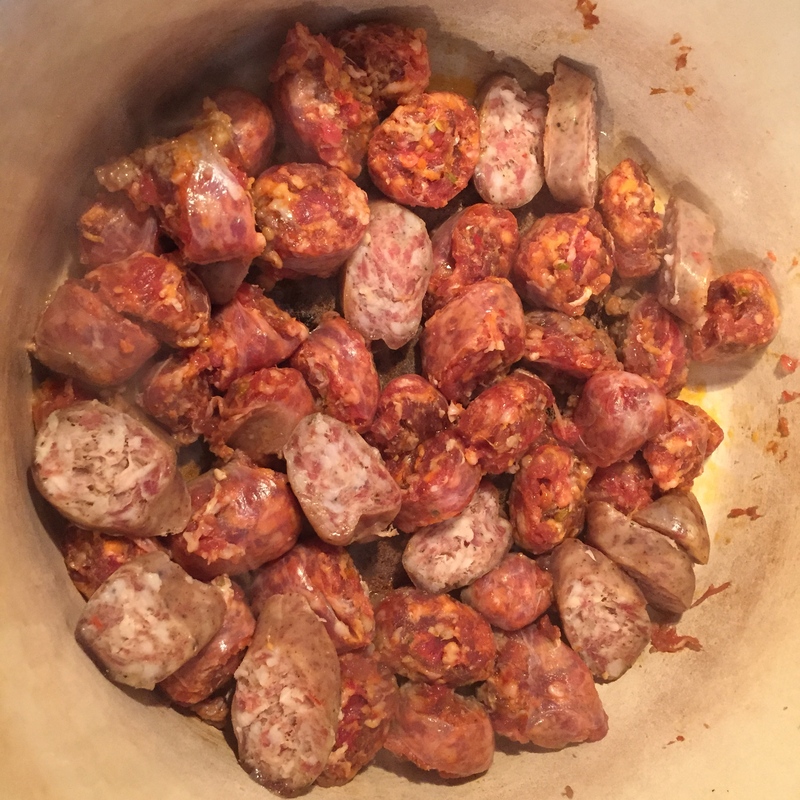 If you need more heat and you used spicy sausage then you are a bada…mamma jamma. You see, you do get a bit of rendered fat on top. It ain’t bad, I promise. Enjoy! Here’s picture for reference. This time I just used ground hot Italian sausage. It didn’t render nearly the fat. And it’s a more golden potato looking soup. Both were magnifico! 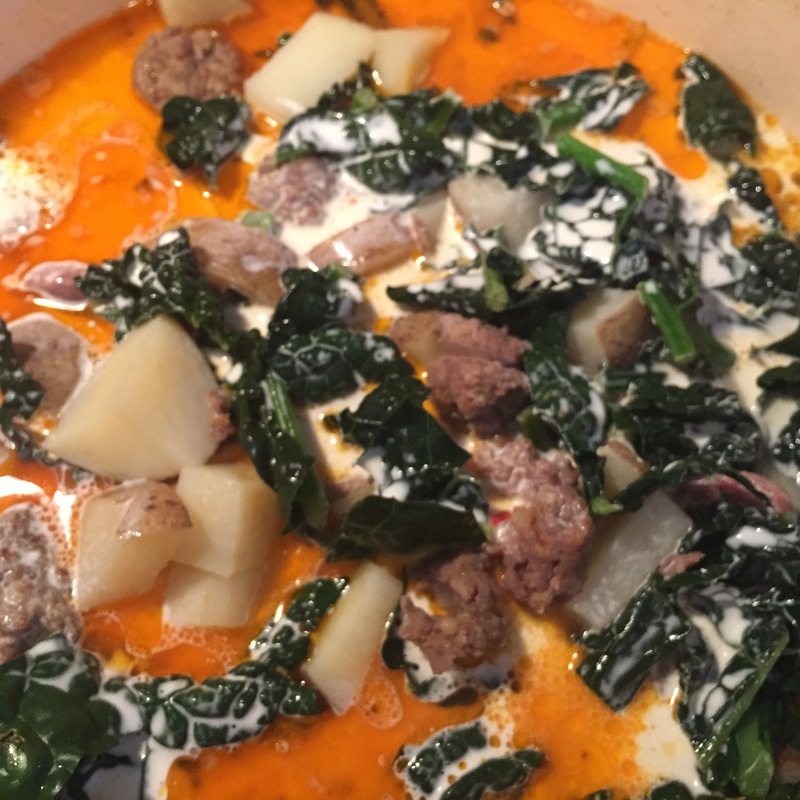 This entry was posted in recipes and tagged easy, kale, potato soup, potatoes, recipes, soup, Spicy Sausage, test kitchen, toscana, winter, zuppa on April 27, 2015 by triadfoodies.